These Sign Supplies Make Sidewalk Advertising Easy! This is Where to Buy Discount Sign Supplies In Bulk! Sign Supplies for Vinyl Banners and More Here! 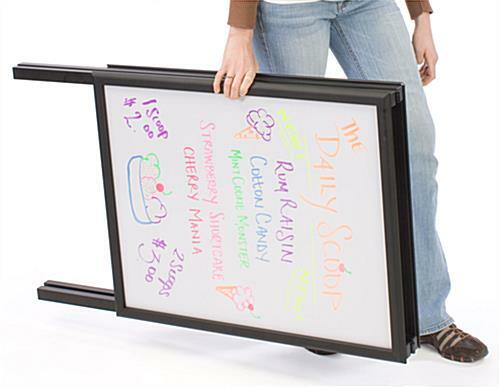 A Frame Signs use writeable white board surface to display messages. Snap frame design allows easy access to board. Clear protective lens helps protect board from elements. 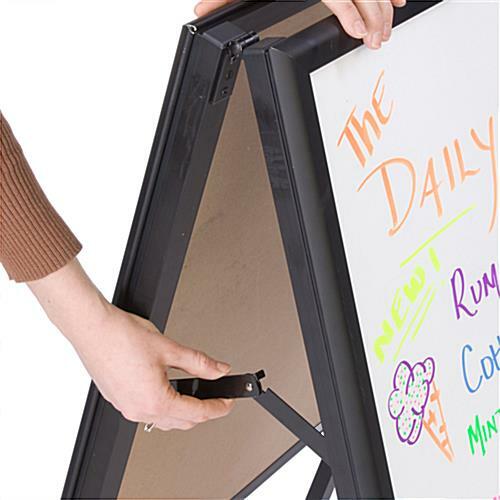 Black polished aluminum frame complements the 21-1/2"w x 27-1/2"h white board. 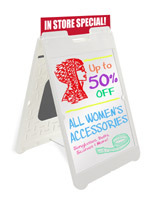 These sign supplies have a large 21-1/2" x 27-1/2" write-on white board on each side. 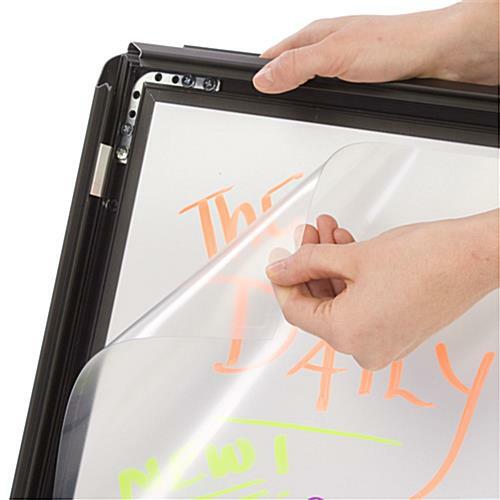 The white board is designed for wet erase markers only. These sidewalk signs, sign supplies, have a snap-open side frame that keeps the non-reflective lens in place. Snap-open frames make it easy to make changes when needed. Just snap open the frame, remove the protective lens, and write your message. Replace the lens and snap the frame closed for a highly visible sidewalk sign that cannot be tampered with. 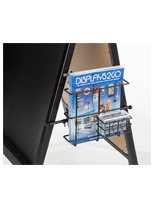 Buy sign supplies online now and reap the benefits of these affordable advertising aids. 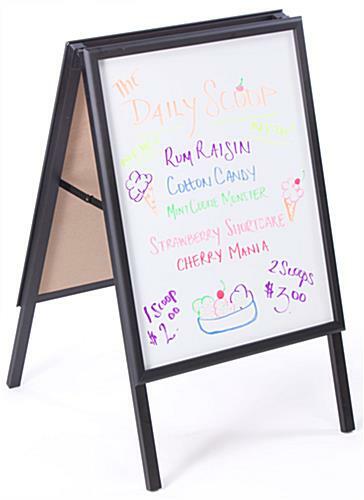 Sidewalk signs, sandwich boards, and other sign supplies are two-sided signs that are perfect for indoor and outdoor advertising. When the weather is nice, place one of these advertising signs on the sidewalk and passersby can view your message from both directions! 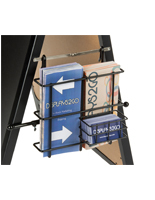 These quality sign supplies for sale here are the perfect choice for restaurants, bars, retail stores, schools, churches, and more! 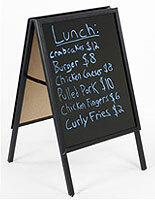 These sign supplies, outdoor sandwich boards, with their non-glare lens, are able to endure mildly inclement weather. The non-reflective lens also keeps the sun's glare off the sign making it easier to read. The sign supplies featured here are constructed with two (2) white, write-on surfaces that allow the advertising to be seen from two directions at once. 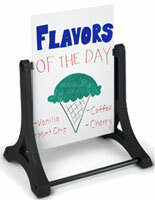 These sandwich boards, sign supplies feature are collapsible so they are easy to carry and store. Buy ready to ship sign supplies for sale at wholesale prices now! Please Note: Although these aluminum sign supplies are predominately used for outdoor sidewalk advertising; and the aluminum is ideal for rust prevention, there are some limitations! The gloss white writing surface has a wood-based substrate. It can withstand many rain showers; but as true with any wood-based product, over time if sign is left permanently exposed to rain & wetness (not brought inside during extreme conditions) some bowing, warping, & delaminating may occur. However, customers have had good luck with life expectancy of this sidewalk sign, just try to bring indoors during days of extreme rain. 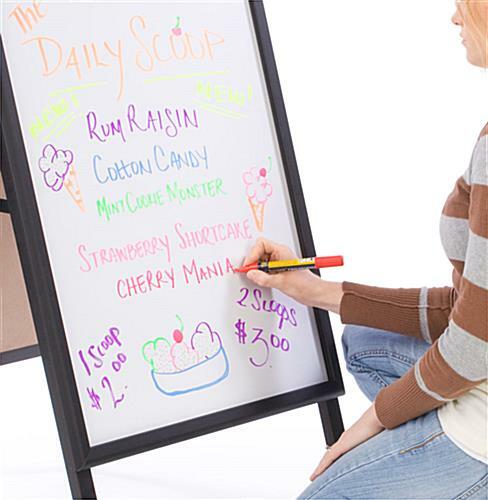 This board can only be used with neon/fluorescent wet erase marker; it is not designed for dry erase markers. Writings are easily erased with damp or moist cloth.